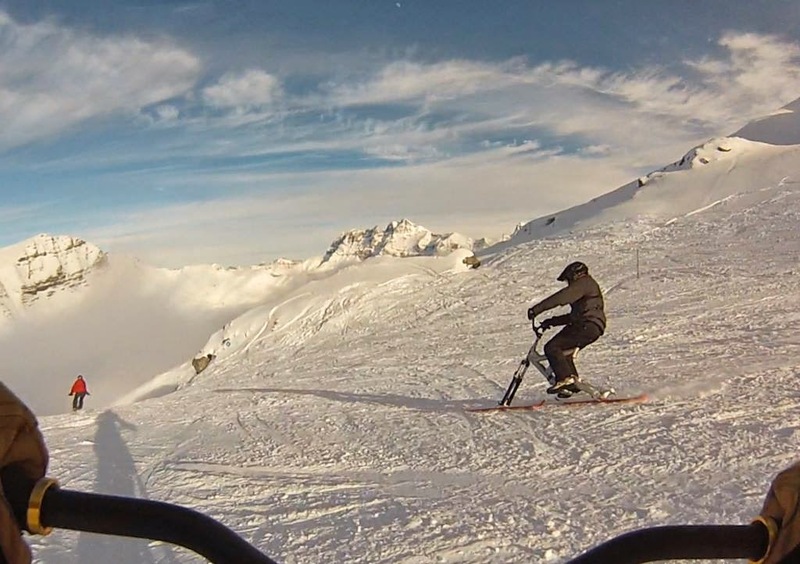 Today's visit was to a perennial favourite skibiking spot, Avoriaz. It is a relatively high altitude resort, at least by the standards of the Portes du Soleil and holds the current French record for the highest average snowfall. It offers a good mix of runs; with difficult and steep open skibiking on one side and more sheltered, easy tree line skibiking on the other. It also has a number of links to neighbouring Portes du Soleil resorts, but you have to do your research, because many aren't so skibike friendly, Châtel being somewhat notorious for allowing you to come down, but not go back up again. 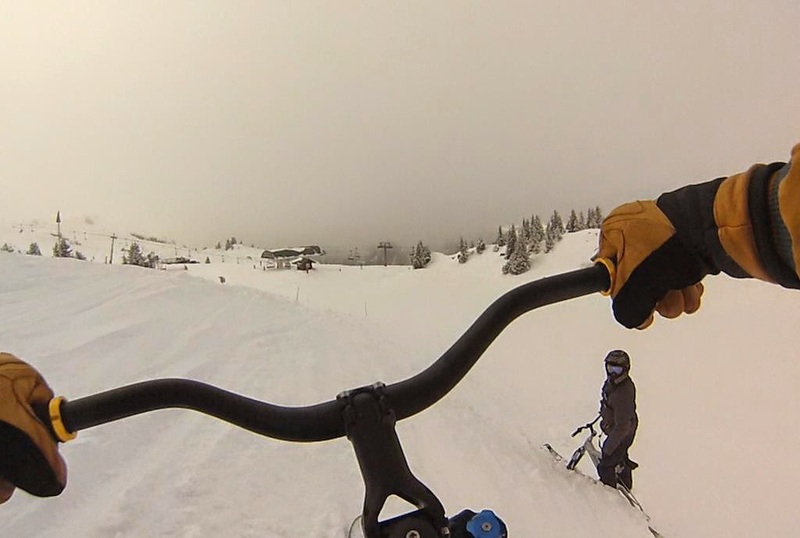 For the first time ever, I arrived at Avoriaz ahead of the French skibikers and had already got in an exploratory ride before they made it to the top station. Sadly, the most testing runs where murky in the extreme and this is also where the best powder pockets are to be found. But it isn't much fun and can be downright dangerous when you can't see the drop-off points. So instead we headed over to the lower, Les Lindarets side, below the level of clouds and played on some very nice runs through the woods, darting from the slope to the trees and back again. We then went even lower down to Ardent, where we encountered an E.S.F. instructor who seemed very keen to convert his downhill bike, so hopefully we may have a new advocate by next season. We headed higher to the top of the Col du Bassachaux on the frontier with Châtel, where skibikes are not allowed on all chairlifts. Moving further along to the Pointe de Mossette above Champery les Crosets and the border with Switzerland it was a different story. The lift operator said he could see no problems as SnowScoots use his lift all the time and as if to prove a point one rode past. On our next visit we will have to get the Portes du Soleil (whole domain) pass and give it a try. After lunch we headed over to sunny Super Morzine and some lovely quiet and enjoyable glade runs, on which I could gladly have spent all day. But the sun had finally broken through the dense cloud at Les Haut Forts, so we headed there pronto in order to get the last run from the top all the way down to the car park. With lots of piled up snow in some spots and scraped bare to ice in others it was quite challenging, but a great way to end a near perfect day at Avoriaz. Special mention should go to Thierry who put in some truly audacious off-piste riding and Stephane who's riding is progressing at lightning speed and many thanks for lunch too.